Heat oven to 400°F. Mix together the tomatoes, green chilies, garlic, and chili powder in a bowl. Place 1 tortilla on a greased, rimmed baking sheet. 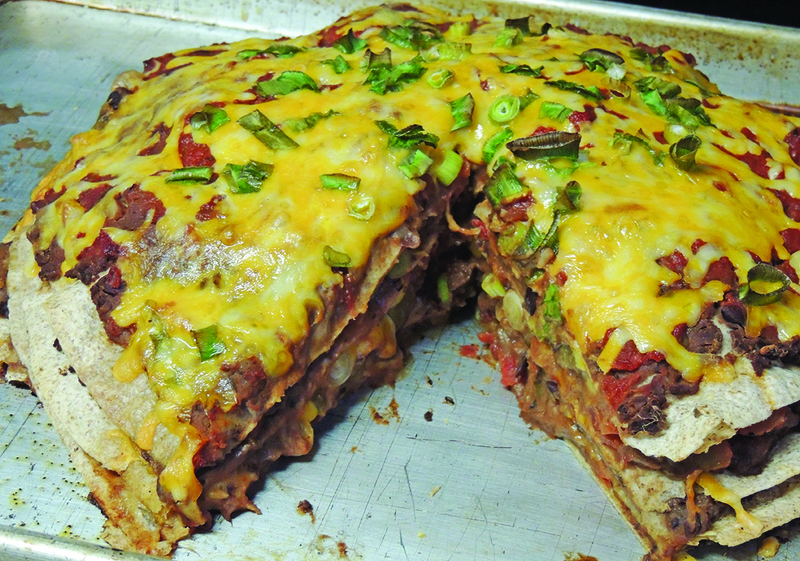 Spread ½ can of refried beans over tortilla, spreading to about a half-inch of the edge. Top with a layer of tomatoes, then sprinkle with ½ cup of cheese. Place another tortilla on a clean surface and spread with ½ can of refried beans. Place on top of first layer and add the tomatoes and cheese. Repeat layering process once more using remaining tomatoes. For the final tortilla, spread the salsa on top of the beans, sprinkle with remaining cheese and the green onions. Bake for 35-40 minutes. Cut into wedges and serve with sour cream if desired.